Only a handful of authors have written historical novels set in medieval Sicily. This is a little studied but fascinating corner of history, well worth knowing better. Christians and Muslims live alongside each other in many cities and communities, though not without suspicion and prejudice from both sides while, elsewhere in the world, a war between Western Christians and Eastern Muslims rages. Sound familiar? Sicily is the island at the toe of Italy's boot. A Mediterranean crossroads from ancient times, it was colonized by Greeks, Phoenicians, Carthaginians, Romans, Byzantines, and Germanic Lombards. During the ninth century, it was invaded and conquered by Muslim Arabs from North Africa and Moors from Southern Spain, known collectively as Saracens. Medieval Sicily's Saracen rulers made a lasting impression on Sicilian culture. The Saracens imported and grew exotic foods such as oranges, lemons, pistachios and sugarcane. They built a lavish palace in their capital at Palermo, as well as mosques with a distinctive domed style that had a persistent influence on the island's architecture. 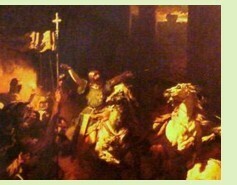 Christianity was tolerated under their rule, perhaps one reason why Sicily's later Christian rulers returned the favor. During the eleventh century, Normans mercenary knights migrated to Sicily to serve under various Byzantine and Lombard aristocrats. In 1060 a Norman knight, Robert Guiscard, migrated from Normandy to the Principality of Capua in southern Italy, whose ruler was at war with neighboring Salerno. Guiscard was a skilled military leader and politician. One thing led to another, and in 1072, after a string of victories in mainland Italy, he took Palermo as well. The early part of the story of Guiscard and his eleven brothers, sons of the Norman knight Tancred de Hauteville, is told by Jack Ludlow in Mercenaries. The novel begins in Normandy in 1033 and follows the brothers to Italy, but stops short of Guiscard's Sicilian adventures. Mercenaries, published in 2009, is the first novel in the forthcoming "Conquest" series, which will hopefully tell the story of Guiscard's conquest of Sicily in another volume. Gabriella Brooke's 1998 novel The Words of Bernfrieda is narrated by the half-sister of Lady Fredesenda, Robert Guiscard's mother. In Brooke's story, Bernfrieda, a nun who worked in a monastic scriptorium, did not see why women should be left out of the historical records kept by the monks. She began setting down her memories of Fredesenda and the Norman migration to Italy from a woman's perspective. Another novel about the Norman conquest of medieval Sicily from a woman's perspective is Cecelia Holland's Great Maria, about the wife of a fictional Norman soldier. Alfred Duggan's 1964 novel Count Bohemond focuses on Robert Guiscard's son Bohemond. The tolerance of Sicily's Christian rulers for Muslim worship and culture at home did not stop them from participating in the Crusades against Muslims elsewhere. 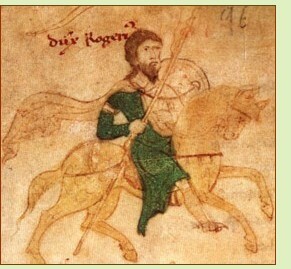 Duggan's novel is largely about Bohemond's exploits as a Crusader. Control of medieval Sicily passed piecemeal, a valley here and a city there, from the Saracens to the Normans over the following half century. Finally, a son of Robert Guiscard's brother Roger united all of Sicily and Norman southern Italy under his rule and was crowned King Roger II of Sicily in 1130. King Roger presided over a diverse court, whose administrators included men of many nationalities, both Christian and Muslim. Tariq Ali's 2005 novel A Sultan in Palermo is about King Roger II (known to his Arabic subjects as Sultan Rujeri) and his Arabic geographer and friend al-Idrisi. A view of King Roger's court from lower in the heirarchy comes from Barry Unsworth's 2006 The Ruby in Her Navel, about a Norman employee in the ministry of finance and state secrets. King Roger's daughter Constance was born after his death. She married the Holy Roman Emperor Henry VI, who died when her son Frederick was three months shy of his third birthday. Young Frederick, heir to the crown of Sicily, was brought up there. 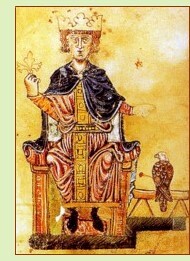 He became Holy Roman Emperor in 1220 as a young man of twenty-five, but spent little time in his German lands. 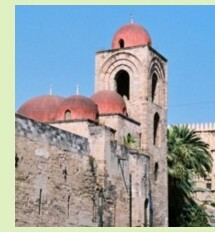 Maria R. Bordihn's 2005 novel The Falcon of Palermo emphasizes how medieval Sicily's Muslim heritage and attitudes of relative tolerance influenced him as a child growing up in Palermo. Another novel featuring Frederick II is Frank Yerby's The Saracen Blade , published in 1952. It's about a Sicilian blacksmith's son who gains wealth and power during the Crusades after Frederick befriends him. Terry Stanfill's 2001 The Blood Remembers is a time-slip novel that turns on a mystery involving Frederick II. It's about a modern woman who begins hearing the voice of a mysterious medieval woman. Driven to find out more about this woman, she travels in England, southern Italy and Normandy, finally discovering in the distant past a key to her own existence.